Xu Lei is a Chinese artist who uses traditional tools, namely, rice paper and inkbrush and absorbs inspiration on spirit and structure from Song period painting and Ming period opera woodcuts. He opens a new path for Chinese painting by extracting modern concepts from Rene Magritte, Yves Klein and Marcel Duchamp. 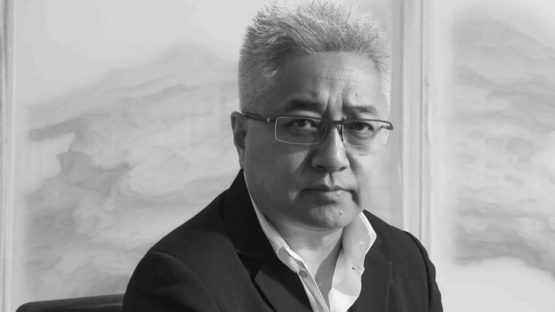 Born in Nantong, Jiangsu, China in 1963, Lei graduated from Nanjing Arts Institute in 1984, and currently works at the Creation Research Centre of China Art Academy and is the Art Director of Today Art Museum and the Editor-in-chief of “Classics” magazine. In his works, he puts delicately drawn horses, chairs of the Ming period, butterflies or birds in stage-like virtual spaces between curtains or between folding screens embroidered with ancient maps. Through subtle interplay of motifs, the relationship between “emptiness” and “phenomenal form”, the very essence of the traditional Chinese life philosophy and aesthetic, is elaborated fascinatingly in a language truly modern. A piece of his work is selected by Chateau Mouton Rothschild for use on its label for the vintage 2008.